You will know that how high up your ad appears on the Google results pages is absolutely critical in determining how successful your advert will be. According to AccuraCast's recent analysis of close to two million Google ad clicks, the clickthrough rate for adverts in position one averages at 7.11%, whereas those in position nine averaged only 0.55%. 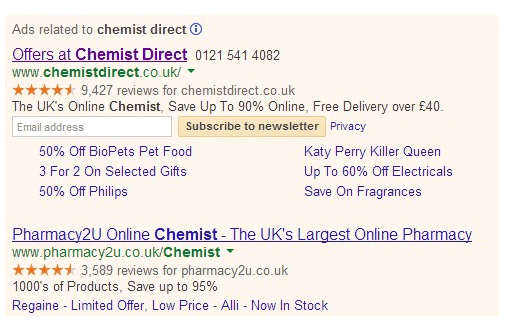 This shows just how much influence ranking has on your ads success. The graph above highlights the importance of occupying position one, showing a huge drop in CTR for ads in position two, and a gradual decline in CTR through ad positions. An additional benefit of getting an ad in position one can be seen in the image below. Ads get all sorts of additional bells and whistles including star ratings, text boxes with linking buttons, site links and local listings. This serves to increase the space these ads occupy above the hold, pushing down competitor results and organic listings. 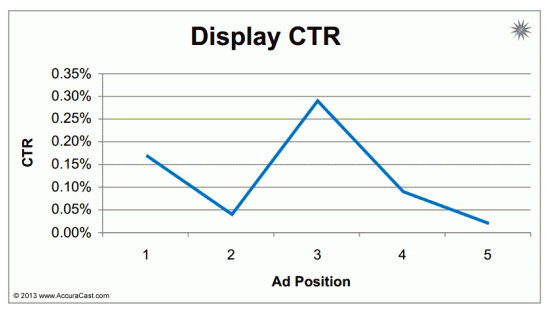 When comparing click-through rates for each position over the past twelve months with the results of a similar study conducted by AccuraCast in October 2009, we find that while the CTR for ads in position one have decreased slightly, the drop-off from position one to position two is much more stark, and the decline thereafter is also steeper. This indicates that Google is making it more worthwhile to be in position one not by increasing the CTR for this spot, but by taking focus away from the lower positions. During research into the search partners network Accuracast came across a surprising result: the click through rate on the Search Partners Network is highest at position 5! Their theory is that on certain partner sites the 5th ad is on the bottom of the first ad block or the top of the second ad block, favorable positions to get noticed. 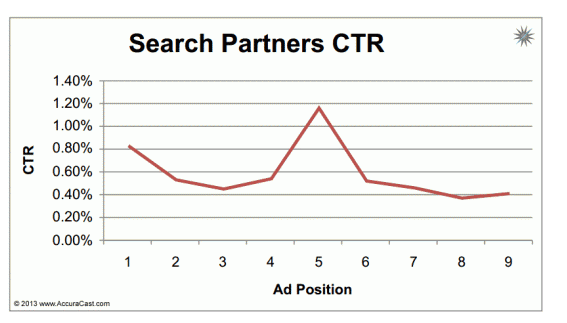 It would be very interesting to hear your thoughts in the comments below: Why is the CTR for search partner ads highest at position 5? Overall, though, the influence of position on click through rates is far less significant on Google’s search partners with each position, apart from the spike around position five, having a more or less similar CTR. 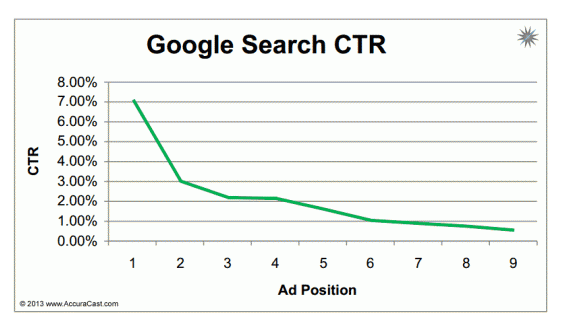 CTR for position one on the search network is only marginally higher than that for ads in positions two though nine, as the above graph demonstrates. A simple explanation of this could be the relatively modest amount of information accompanying ads on the search partners network, as demonstrated below. Interestingly, position one is not the most influential on the Google Display Network and this can be seen in the graph below. Position three actually offers a better CTR, potentially because it is at the bottom of the regular rectangle ad unit (the most common size) and thus, closer to the content. Do you have any theories on this CTR spike? Let us know in the comments below. Data for this study was drawn from the analysis of over two million clicks, collected during a year-long period from advertisers across a wide variety of industries. Thanks to Farhad Divecha for sharing their advice and opinions in this post. Farhad Divecha is Managing Director of AccuraCast You can follow him on Twitter or connect on LinkedIn. Did you notice a disconnect between your click-through rate and conversion rate? It’s time to check the issues and optimize your website Generating customers through digital marketing is now one of the most popular tactics for promoting your brand. Popular, ….. There is a pool of great PPC tools that can help you see how your competitors rank, how many PPC ads they are running, how much they are spending and where they are being shown The online space is getting …..